Listen to what you want and observe what your lashes can handle. Takes time to pursue perfect bonds. Her appointments are not short. Krisel takes longer than other Lash salons applying lashes. She will apply more lashes than other salons so you can come in less often (every 4 weeks). Use surgical optics and professional LED photography lighting (4500 Lumens) that allows us to see every eyelash follicle. Kris is dedicated to enhance the beauty of eyes and brows. With over 18 years of experience as a Lic. Cosmetologist/ Lash Artist with NovaLash Inc./ Everlasting Brows Therapists. ​Offering a full range of services to satisfy the individual needs with the most sophisticated techniques in the Microblading industry and eyelash extensions to give you a glamorous appearance even with little or no makeup. Using ONLY MEDICAL GRADE EQUIPMENT. Instead of relying only on ambient light and naked eye, Kris uses surgical magnifying loupes and broad light spectrum lighting to ensure optimal visual of your lash application. My main tools are swiss made and uniquely designed to ultra find hair as opposed to one-size-fits- all tweezers that are standard fare in esthetics. I want to make sure I match the right lash extension to your lashes so that they look natural. If you rush, your lashes can look fake, her appointments are not short. 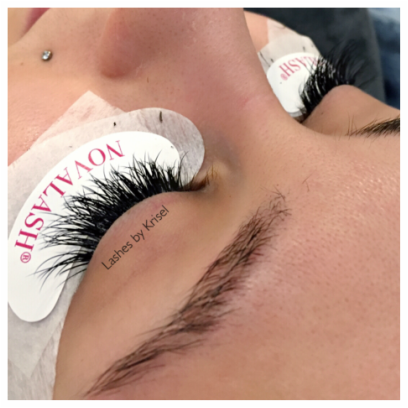 Kris want to put more lashes than other lash salon so that you can go up to 4 weeks between appointments, taking time to apply each individual lash extension to maintain your natural lashes growing healthy. Whether you need Brows Enhancement, Lash Extensions or Brows Grooming my goal is for you to leave feeling confident & renewed.